This story was updated at 6 a.m. ET. An unmanned rocket turned night into day early Thursday (Aug. 30) as two heavily armored NASA spacecraft finally launched into orbit to study Earth's harsh radiation belts after a week of delays. The twin Radiation Belt Storm Probes mission launched at 4:05 a.m. EDT (0805 GMT) today from Florida's Cape Canaveral Air Force Station, lighting up the predawn sky as it soared into space atop an unmanned United Launch Alliance Atlas 5 rocket. 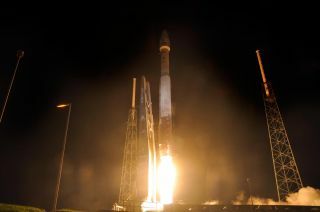 The liftoff had been planned for Aug. 23, but it was pushed back two days due to technical glitches, and then another five days to avoid foul weather from Tropical Storm Isaac. "It was a wonderful event, a very smooth countdown," NASA launch manager Tim Dunn said after the launch, adding that the Atlas 5 gave NASA's newest science satellites "a great ride." "We're all thrilled. Just excited as can be," Dunn added. After a 60-day commissioning period on orbit, the new radiation-tracking spacecraft will begin the science phase of their two-year mission, which aims to help scientists understand how Earth's two doughnut-shaped Van Allen radiation belts affect our planet's space weather. A NASA camera provides this zoom view of the Atlas 5 rocket launching the twin Radiation Belt Storm Probes into orbit on Aug. 30, 2012, from Cape Canaveral Air Force Station, Fla. Such information could have considerable practical applications, researchers said, since extreme space weather can knock out satellites and disrupt GPS signals, radio communications and power grids. The twin solar-powered probes will ply the Van Allen belts, where trillions of high-energy charged particles from the sun have been trapped by Earth's magnetic field. These fast-moving particles can damage satellites and potentially pose a threat to orbiting astronauts. To deal with this harsh radiation environment, critical components on each RBSP spacecraft are shielded by 0.33 inches (8.5 millimeters) of aluminum. Though the two belts were discovered in 1958, they remain mysterious today. For example, the belts sometimes react quite differently to seemingly similar solar outbursts, for reasons scientists don't yet understand. The RBSP team hopes the twin probes can help researchers get to the bottom of such puzzles. "RBSP was designed to answer the questions of how these radiation belts are responding," said mission deputy project scientist Nicola Fox, of the Johns Hopkins University Applied Physics Laboratory in Laurel, Md. The nearly identical RBSP spacecraft are about 6 feet wide by 4 feet tall (1.8 by 1.2 meters), though their span increases to 10.5 feet (3.2 m) with their solar panels deployed. Each weighs roughly 1,400 pounds (635 kilograms). The probes will fly in formation through the Van Allen belts on highly elliptical orbits, mapping out the regions' magnetic fields and charged particle density with their eight science instruments. "We need eight because we're measuring across this huge [particle] energy range," said Harlan Spence of the University of New Hampshire, one of the mission's principal investigators. And launching two spacecraft rather than one is not redundant, either, scientists said. The probes' observations will allow researchers to determine whether differences in radiation levels inside the belts reflect changes across space or time. Together, the RBSP spacecraft will precisely track how the Van Allen belts ebb and flow over time. This information — combined with observations from sun-watching spacecraft like NASA's Solar Dynamics Observatory —could greatly improve scientists' space weather forecasts down the road, researchers said. RBSP's measurements could also have more immediate benefits, they added. The probes' observations "will be delivered in near real time to users all over the world, so that those users can use the space weather data to protect sensitive ground-based as well as space-based assets," said Michael Luther, deputy associate administrator for programs for NASA's Science Mission Directorate.